Lantern Court Motel Lovingly restored by the Scheerhoorn family to recreate the golden days of Reefton. With over 30 years’ experience in hospitality we provide a wide range of self-catering accommodation options to suit a variety of budgets, from Superior accommodation for the discerning travellers as well as a 3 bedroom apartment and quality 1 and 2 bedroom self-contained units suitable for families and groups at an affordable price. Ground or first floor, Spa or Access units, Baby Cots & High chair, Guest Laundry, Off street parking and our very large garage is a winner for secure Motor cycle and bike storage. Centrally located Lantern Court is close to all amenities. Your hosts Bronwyn and Frank, and the Scheerhoorn family are here to welcome you, living on-site we are available to assist you with local knowledge to explore what this fascinating region has to offer and ensure you make the most of your time here in Reefton. Some say Reefton is the West Coasts best kept secret so come on over and share the Mountain biking, trout fishing in pristine rivers, 4 Wheel Driving, motor cross, various levels of walking and cycle trails, skate Park, heated swimming pool, gold panning, Golf, guided rafting with local Nathan and his team or just enjoy our town and appreciate the well preserved history of the region. There is something for the whole family here in Reefton and we have just the right accommodation options to make your stay enjoyable. Reefton is called the first town of light as it was the first town in the Southern Hemisphere to have electricity. The township has many historical elements that adds to its character. 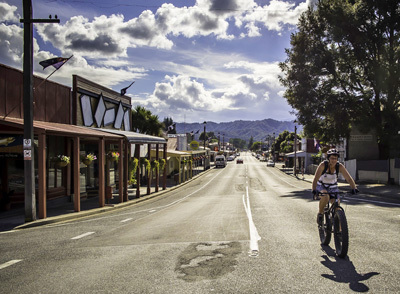 Combine this with rivers that once were home to the huge gold mining industry, and bush walk and mountain bike rides Reefton would have to be one of the South Islands best kept secrets. Discover it for yourself.